Summary: Bells Broussard thought he had it made when his superpowers manifested early. Being a shapeshifter is awesome. He can change his hair whenever he wants, and if putting on a binder for the day is too much, he’s got it covered. But that was before he became the country’s most-wanted villain. Review: I’ve been looking forward to this book since the secod I finished the first book in the Sidekick Squad series, Not Your Sidekick (review here). As I’m sure you can tell, I loved Not Your Sidekick — Asian rep! Queer rep and romance! Adorable friendship! Wonderful superhero worldbuilding! It had everything. Not Your Villain builds on that and is a wonderful addition to the series. Not Your Villain centers around another member of Jessica Tran’s friend group — Bells Broussard. The book starts a while before Not Your Sidekick does, with Bells going to superhero training in Aerial City. Training is challenging for a number of reason: He’s afraid of heights, for one thing, and he must keep his identity secret because of who he is and who his family is. But Bells has more potential than anyone, including himself, realizes. The story eventually catches up to the events of Not Your Sidekick, and when he’s framed as one of the most wanted villains around, his relationships and superhero abilities are tested. 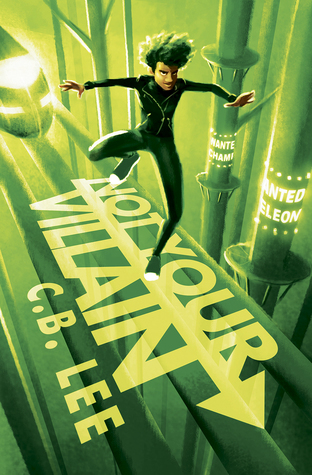 The chronology of events in Not Your Villain definitely wasn’t what I expected, but I enjoyed the chance to learn more about the world and Bells through the flashbacks and flash-forwards. Bells is such a wonderful hero: He’s good-hearted and determined, his hair is ever-changing, and he comes from a family of activist farmers. That’s pretty darn cool. There’s so much to love in Not Your Villain. If you haven’t read Not Your Sidekick, definitely go read that, and then move on to Not Your Villain. I can’t wait to read Not Your Backup, and I know it’ll be just as amazing as the first two books in this series. If you love superhero YA, this is absolutely a must-read.